A helicopter dumps water to battle the wildfires in Anaheim Hills in Anaheim, Calif.
GOES-16, operating as NOAA’s GOES East, is proving to be an invaluable asset in detecting wildfires and helping forecasters provide proactive tactical decision-support services. The satellite provides a much more detailed look at fire conditions, faster detection of hot spots, and the ability to track fire progression and spread in real time. GOES-16 is also important in monitoring burn scars and predicting flash flood events from rain events after a fire. GOES-16 provides critical data for the entire lifecycle of a fire disaster – from drought to fire to floods and landslides. Learn more about GOES-16’s contributions to helping fight deadly wildfires in this feature story. The AMS Short Course on GOES-R Series: Forecasting Applications will be held on January 6, 2019, preceding the 99th American Meteorological Society (AMS) Annual Meeting in Phoenix, Arizona. The primary goal of this course is to familiarize users with GOES-R Series capabilities, and how it can improve their services to customers, saving lives and property. The course will showcase a brief overview of the ABI’s 16 channels, GLM, insight on how to access existing resources (web page, educational pages, etc. ), and an understanding of the options available to acquire GOES-R imagery and products. The course will then immerse students into 3 different forecasting challenge topics, i.e. aviation forecasting, fire weather, and convective weather. Each of these topics will cover specific GOES-R Series products and applications with hands on case studies and lab exercises. The overarching goal is to introduce users to techniques and applications to improve observations, forecasting and warnings to help bridge the gap between old and new in the most efficient manner in a field where every minute counts. A special lunchtime presentation will feature NOAA's Big Data Project CRADA and Google Cloud's Public Dataset Program. Students from grades 6-14 are invited to participate in the GOES-R Education Proving Ground GOES-16/17 2019 Virtual Science Fair. Students will use data from the GOES-16 and GOES-17 satellites to investigate weather and natural hazards. There will one winning team in each of three categories: middle school, high school and grades 13/14 (community college or university). Each team will consist of 2-4 students and 1 teacher/coach per entry. Entries will be accepted March 1 – May 3, 2019. Students from the winning teams will receive $25 gift cards and official GOES-T launch viewing invitations to Kennedy Space Center (but no travel support). Teachers coaching the winning teams will garner GOES-T launch invites (no travel support) and conference travel support to attend and present at the 2020 American Meteorological Society (AMS) Centennial meeting in Boston. NOAA’s collaboration with Amazon Web Services expands public access to big data. A NOAA collaboration with Amazon Web Services expands public access to big datasets. NOAA generates thousands of datasets as part of its mission to collect information on environments that span from the surface of the sun to the depths of the ocean floor. More than 68,000 datasets are made publicly available from NOAA with the National Centers for Environmental Information (NCEI) providing access to more than half of those datasets. With such vast holdings, NOAA faces the challenge of providing access to the data in an efficient and scalable manner. NOAA’s Big Data Project (BDP) helps address this challenge by collaborating with Amazon Web Services (AWS), Google Cloud Platform, IBM, Microsoft, and the Open Commons Consortium to host NOAA’s public data on their cloud platforms. GOES-16 data is included in these platforms. UPDATE: On November 20, 2018, technicians observed an error from NOAA’s GOES-17 Advanced Baseline Imager (ABI) – unrelated to the ongoing issues with the loop heat pipe – that resulted in degraded infrared imagery. The technicians determined a recent update to software that controls the ABI cryocooler system (which pumps heat away from the instrument’s detectors to cool them to their required operating temperatures) experienced a memory error. This caused the cryocooler to shut down. The cryocooler operation is now restored, with no additional degraded imagery resulting from the error. Engineers are testing a permanent software solution that should conclude in January 2019. Once the fix is confirmed, NOAA will declare GOES-17 the new GOES West satellite See the GOES-17 Transition to Operations web page for additional details. GOES-17's Advanced Baseline Imager (ABI) captured this GeoColor view of high-level clouds moving over low clouds over the Hawaiian Islands on November 13, 2018. Convective clouds can be seen forming on the windward side of the mountain slopes of the islands. This imagery is preliminary and non-operational. GOES-17 shared its first high-definition images from its new vantage point over the Pacific Ocean, showing the western U.S., Alaska, Hawaii, and the Pacific Ocean in stunning detail. The new imagery became available on November 13, 2018, shortly after GOES-17 arrived at its new orbital position at 137.2 degrees west longitude. Once it becomes NOAA’s operational GOES West satellite on December 10, 2018, GOES-17 will significantly enhance our ability to forecast the weather in the western United States, especially in Alaska and Hawaii. With its expanded satellite coverage at high latitudes, GOES-17 will provide a significantly clearer view of the state of Alaska, where it will improve our ability to track environmental conditions, such as sea ice, volcanic ash, snow cover and wildfires. 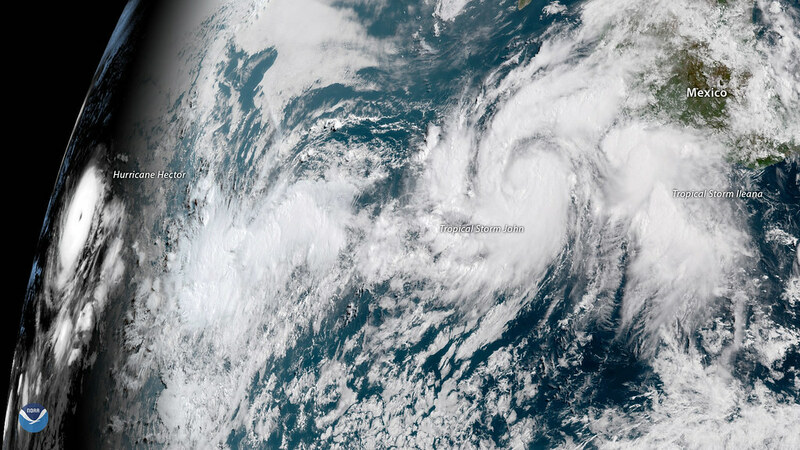 GOES-17 will also provide more and better data over the northeastern Pacific Ocean, where many weather systems that affect the continental U.S. begin. This infrared satellite imagery from GOES East shows cloud top temperatures. The cool colors indicate colder cloud tops and highlight areas where snow squalls would be more intense. On November 1, 2018, the NWS expanded its winter weather warning program to include snow squalls. Snow squalls are short-lived bursts of heavy snowfall that result in the rapid onset of near-zero visibilities and are often accompanied by gusty winds, according to the National Weather Service. Learn how satellite data, like that from GOES-16 (GOES East), can help forecasters issue snow squall alerts in this feature story from NOAA Satellites. The GOES-17 Handover Readiness Review was successfully completed on October 19, 2018. The review certified readiness to transition operational responsibility of GOES-17 from the GOES-R Program to the NOAA Office of Satellite and Product Operations (OSPO) operations team. Results of the review were presented to Stephen Volz, NOAA Assistant Administrator for Satellite and Information Services on October 22 and the satellite was officially handed over to OSPO. GOES-17 will begin drifting to its operational location on October 24, 2018. GOES constellation coverage once GOES-17 is in position at 137.2 degrees west longitude. NOAA’s GOES-17 satellite is getting ready to move to its new vantage point at 137.2 degrees west longitude, allowing us to see the weather at high resolution in the western U.S., Alaska and Hawaii, and much of the Pacific Ocean. For the past seven months, the satellite has been in a temporary position – at 89.5 degrees west longitude – known as its on-orbit checkout location. Since then, scientists have been testing and calibrating GOES-17’s instruments so it is ready for “prime time” when the satellite becomes operational. The relocation process, known as “drift,” will take about three weeks to complete. See the GOES-17 Transition to Operations webpage for details. GOES East sees Hurricane Florence make landfall near Wrightsville Beach, North Carolina, at 7:15 a.m. ET on September 14, 2018. The GOES-R Series Program Newsletter for the time period July – September 2018 is now available. GOES-17 has nearly completed post-launch testing and preparations are underway for the Handover Readiness Review and transitioning the satellite to operations as GOES West in December. The team of experts addressing the Advanced Baseline Imager (ABI) cooling system issue has made excellent progress. As a result of efforts to optimize its performance, the GOES-17 ABI is now projected to deliver >97% of the data it was designed to provide, a truly remarkable recovery. In parallel, the independent investigation team has isolated the likely root causes to help us understand the issue and how to avoid it. Redesign efforts are underway for the GOES-T and GOES-U ABI radiators based on their recommendations. 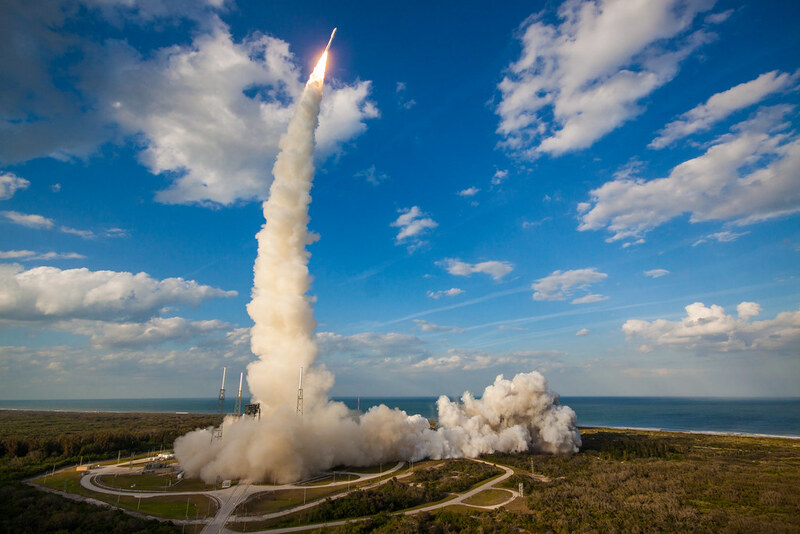 A United Launch Alliance Atlas V rocket lifts off from Space Launch Complex 41 at Cape Canaveral Air Force Station carrying GOES-S on March 1, 2018. NASA and NOAA have appointed a board to investigate an instrument anomaly aboard the GOES-17 weather satellite currently in orbit. During post-launch testing of the satellite’s Advanced Baseline Imager (ABI) instrument, it was discovered that the instrument’s infrared detectors cannot be maintained at their required operating temperatures under certain seasonal and orbital conditions ,resulting in a loss of approximately three percent of the instrument’s availability over the course of a year. This loss exceeds a key design requirement. NASA and NOAA senior leadership have determined the need to convene the mishap investigation board, which will work to determine the root or proximate cause of the anomaly and identify actions to prevent occurrences on future satellites. The board will begin its work as soon as possible. Major Hurricane Florence captured by GOES East on September 10, 2018. 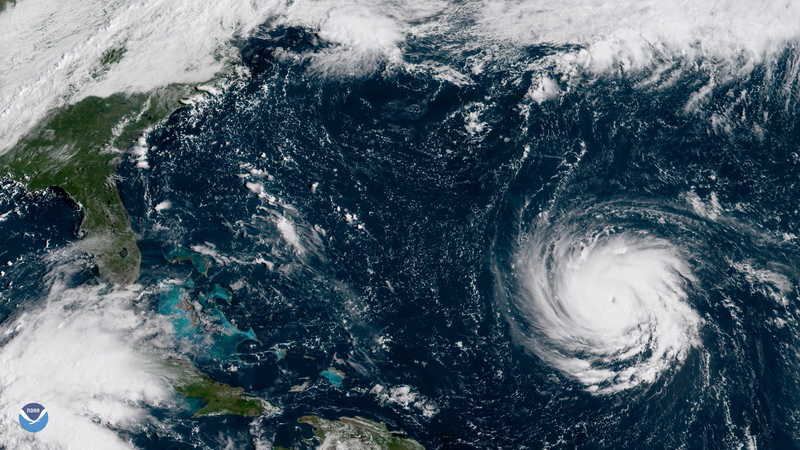 Hurricane Florence is moving toward the U.S. East Coast and has intensified to a Category 4 storm, with one-minute sustained winds of 130 mph. This image, captured by the GOES East satellite at 10 a.m. ET Monday, shows Florence in the western Atlantic, about 600 miles southeast of Bermuda, at Category 3 intensity. The storm has developed a small, but well-defined eye and a symmetrical appearance typical of major hurricanes that are rapidly intensifying. The latest forecast from the National Hurricane Center (NHC) shows Florence continuing to strengthen over the next 12 to 24 hours. The storm is expected to enter a region of very warm sea surface temperatures (near 85°F) and low wind shear, giving forecasters increasing confidence that Florence will be a large and extremely dangerous hurricane as it moves closer to the Southeastern U.S. Damaging hurricane-force winds and a life-threatening storm surge are likely along portions of the coasts of North and South Carolina beginning late Wednesday into Thursday. As the storm moves onto land, forecasters expect the storm to stall, creating potential for exceptionally heavy rainfall and dangerous flash flooding from the Carolinas into the Mid-Atlantic. This GeoColor-enhanced imagery was created by NOAA's partners at the Cooperative Institute for Research in the Atmosphere. GOES-16 view of Hurricane Irma approaching the Leeward Islands as a Category 5 storm on September 5, 2017. A year ago today, a tropical storm named Irma formed near the Cape Verde Islands in the eastern Atlantic Ocean. Within days, Irma morphed into a monster Category 5 hurricane, barreling across the Atlantic and causing widespread damage across the Caribbean and the Florida Keys. The storm’s 5-day track forecasts were remarkably successful – in no small part thanks to improvements in weather prediction models and data from NOAA satellites. More powerful supercomputers, combined with advancements in high-resolution satellite data and observations, are improving our ability to prepare for storms like Hurricane Irma and other extreme weather events. An example of degraded imagery from ABI Band 16 on August 14, 2018, near the time of peak detector temperatures for that date. This week, NOAA will begin releasing GOES-17 Advanced Baseline Imager (ABI) “beta” level data and imagery – data that are still preliminary and not yet fully ready for use – to forecasters and scientific partners. This is an important step in making sure that GOES-17 is ready to do its job of providing timely, accurate data for weather forecasting and environmental monitoring. By distributing this data to the larger NOAA and partner community, we are providing NOAA and the community of users the opportunity to understand the ABI data quality and to prepare to use the data operationally. Lightning strike near a beach. Know the risks before hitting the water. This story map depicts six dangers at the beach and shows how NOAA helps mitigate risks for the nearly 190 million people who visit America’s beaches, Great Lakes and other waterways every year. One hazard is lightning. Thanks to the GOES-16 Geostationary Lightning Mapper, forecasters can monitor lightning activity like never before. Rapid increases in lightning indicate a storm may be strengthening. In many instances, GLM detects lightning before ground-based systems do, helping forecasters provide more accurate, earlier warnings of developing severe storms. August 15, 2018: Severe Storms Show off their “Plume-age"
In May, these plumed storms captured by GOES-16 over northeast Kansas and southern Nebraska produced numerous tornadoes, baseball-sized hail and 80 mph straight-line winds. New research delves into a distinctive cloud formation that often signals damaging storms below. The Above Anvil Cirrus Plume (AACP) is a complex cloud phenomenon that looks like a plume of smoke emanating out from the top of a storm. These plumes have been a frequent sight over the U.S. this summer as severe-weather outbreaks have raked across the Midwest, leaving trails of destruction in their wake. Researchers at NASA Langley identified hundreds of plumed storms over the U.S. using high-resolution imagery from GOES-16. By linking that satellite data to radar and lightning data from the same storms, they learned that that identifying the presence of an AACP can add 10-30 minutes of lead time for storm warnings. Learn more in this article from our partners at NASA Langley. The research findings were published in a study available in early online release through the American Meteorological Society's Weather and Forecasting journal. GOES East captured the partial solar eclipse on August 11, 2018. In this animation from the satellite’s Solar Ultraviolet Imager (SUVI), you can see the moon passing across the sun. A partial eclipse occurs when the sun and moon are not exactly in line with the Earth and the moon only partially obscures the sun. 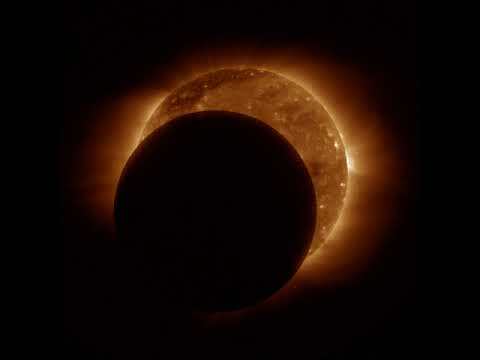 This partial eclipse was visible in northern North America, Greenland, northern Europe and northeastern Asia. SUVI observes the entire solar disk and allows scientists and forecasters to characterize complex active regions of the sun, solar flares, and the eruptions of solar filaments that may give rise to coronal mass ejections. Depending on the size and the trajectory of solar eruptions, the possible effects to near-Earth space and Earth’s magnetosphere can cause geomagnetic storms that can disrupt power utilities and communication and navigation systems. These storms may also cause radiation damage to orbiting satellites and the International Space Station. Women make up nearly half of our country's workforce, but only about 25 percent are employed in STEM (science, technology, engineering and mathematics) fields. NOAA is celebrating the trailblazing women within the agency who prove that women play a critical role in the continued success of the organization. GOES-R System Program Director Pam Sullivan is featured. Learn more about NOAA’s amazing female leaders in this feature story. This 16-panel image shows a snapshot of the continental U.S. and surrounding oceans from each of the Advanced Baseline Imager channels at 2:02 p.m. EDT on July 29, 2018. NOAA has shared the first infrared imagery from the GOES-17 satellite. While experts continue addressing an issue with the cooling system of GOES-17’s Advanced Baseline Imager (ABI), they have made progress in increasing the available observing time of the affected infrared channels. Due to adjustments in operating procedures, the ABI is demonstrating improved performance from initial observations. This new imagery shows data are currently available from all 16 ABI channels. Get additional information and see more GOES-17 infrared imagery in this feature story. GOES East imager of Hurricane Hector and two new tropical storms, John and Ileana, in the East Pacific at 11:30 a.m. ET on August 6, 2018. While the 2018 Atlantic hurricane season has been off to a slow start, it's a different story in the Eastern Pacific, where the tropics have been especially active. GOES East captured this image of Hurricane Hector and two new tropical storms, John and Ileana, in the East Pacific at 11:30 a.m. ET on August 6, 2018. Hector is the fourth hurricane to form in the Eastern Pacific this year, and as of August 6, is a Category 4 storm with 145 mph sustained winds. Here, we see Hector's well-defined eye at the edge of the GOES East satellite's coverage area, as the storm moves westward into the Central Pacific. The latest forecast from the National Hurricane Center shows the storm weakening slightly before it tracks south of Hawaii's Big Island later this week. East of Hector is another tropical disturbance, which has a 70 percent chance of becoming a tropical cyclone in the next 48 hours. Meanwhile, two additional tropical storms – Ileana and John – have formed south of Mexico. Both storms are expected to strengthen into hurricanes in the next 24 hours. Due to their close proximity, John's large circulation might absorb Ileana and cause the storm to weaken as it brushes Mexico's southwestern coast. Number of days with extreme heat worldwide, 1950-2017. An international, peer-reviewed publication released each summer, the State of the Climate is the authoritative annual summary of the global climate published as a supplement to the Bulletin of the American Meteorological Society. Led by scientists from NOAA’s National Centers for Environmental Information, the report is based on contributions from more than 500 scientists in in 65 countries and offers insight on global climate indicators, extreme weather events and other valuable environmental data. According to the report, 2017 was the third-warmest year on record for the globe, behind 2016 (first) and 2015. The planet also experienced record-high greenhouse gas concentrations as well as rises in sea level. NOAA has shared new information on efforts to resolve the technical issues impacting the performance of the GOES-17 Advanced Baseline Imager (ABI), predicting all of the ABI spectral channels will be available for the majority of the day. The ABI, the primary instrument onboard the satellite, has experienced trouble with its cooling system during the orbital check-out phase of GOES-17's six instruments. The other five instruments are performing normally. The cooling system of the ABI is not functioning properly. Currently the loop heat pipe subsystem, which transfers heat from the ABI electronics to the radiator, is malfunctioning. This is preventing adequate cooling for some of the infrared (IR) channels on the instrument during parts of the day, leading to partial loss of ABI imagery. Experts have identified four likely causes for the issue and have recommended a set of ground tests to further isolate the specific root cause. Based on these initial findings, NOAA and NASA are evaluating design modifications for the ABI that would fly on GOES-T and GOES-U. The team of experts have also pinpointed different operating procedures to improve the availability of the IR channels. This will allow the ABI spectral channels to be available for the majority of the day. The availability of the imagery will vary during different times of the year. Initial estimates predict that 13 of the 16 channels will be available the full 24 hours during "cool seasons" (near the summer and winter solstice), with the other three channels available for 20 hours. During "warm seasons" (before the vernal and autumnal equinox), they estimate 10 channels will be available for 24 hours, another 3 will be available for 20 hours, and 3 will be available for approximately 12 hours. Through adjustments in operating procedures and software and algorithm changes, experts hope to revise these estimates as we head into the fall "warm season" for the satellite. After operation through the hot season, estimates of channel availability will be finalized. NOAA’s operational geostationary constellation -- GOES-16, operating as GOES-East, GOES-15, operating as GOES-West and GOES-14, operating as the on-orbit spare -- continues to remain healthy and monitoring weather across the nation each day. Teams of experts continue to work to understand the exact nature of the GOES-17 cooling system anomaly, determine the capacity of the instrument in its compromised state, and maximize its operational utility. These teams are making great progress and the ABI is demonstrating improved performance from initial observations. The team that is working on optimizing the GOES-17 ABI performance has been successful at finding techniques that increase the available observing time of the infrared channels. The root cause independent review team has narrowed down the number of possibilities to a few likely causes. A series of ground-based tests using spare and engineering unit ABI hardware is underway through September to try to isolate the specific root cause. This team has also recommended design modifications for the GOES-T and GOES-U ABIs to ensure we do not experience the cooling system issue moving forward. We still plan to move GOES-17 into operational service in late 2018. Even during the checkout phase, GOES-17 is observing with more channels at a higher resolution with more rapid refresh than what we have with the current GOES-West satellite. Listen to audio from the July 24, 2018, GOES-17 ABI media call. Learn more about the role of loop heat pipes in the cooling system issue in this fact sheet. A large meteor bolts across the sky in Southern Australia on April 24, 2011. What do lightning strikes and meteoroids zipping through space have in common? It turns out they both can be tracked from a weather satellite. Scientists have discovered that the Geostationary Lightning Mapper (GLM) on NOAA’s GOES-16 and GOES-17 satellites sees more than just lightning flashes in our skies. While designed for mapping lightning flashes, GLM can observe large meteors anywhere throughout its coverage area. The instrument takes 500 images of Earth every second, allowing it to measure the shape of a meteor “light curve,” or the change in brightness of a meteor with time, with millisecond precision. Learn more about GLM’s capability to detect meteoroids. The GOES-R Series Program quarterly newsletter for the time period April – June 2018 is now available. Pam Sullivan has joined NOAA as the new System Program Director. All six of GOES-17’s instruments are generating science data and the post-launch test program continues. We are focused on addressing the GOES-17 Advanced Baseline Imager cooling system issue and our teams of experts have made great progress in working toward identifying the root cause and optimizing operational utility of the instrument. ABI is demonstrating improved performance from initial observations we still plan on moving GOES-17 into operational service late this year. View the 2Q 2018 newsletter. This GOES East GLM imagery shows a high concentration of lightning flashes over the Northern Plains on June 11, 2018. Credit: NOAA Virtual Lab. On July 16, a new tool from the GOES East Geostationary Lightning Mapper (GLM) was rolled out to National Weather Service forecast offices across the nation, giving forecasters valuable new information for tracking severe thunderstorms. Until now, GLM data hasn’t been used in operational weather forecasts. The new GLM “Flash Extent Density” product will allow the National Weather Service to see how frequently lightning is occurring over a certain area. When forecasters see the number of lightning strikes rapidly increasing, it’s a sign that a storm is intensifying and becoming more dangerous. This information gives forecasters better confidence when issuing weather warnings that ultimately improve public safety. Learn more about how GLM will help forecasters in this feature story. GOES-17 SUVI view of the sun during a solar flare on May 28, 2018. GOES-17 is sending back stunning images of the sun. On May 28, 2018, the Solar Ultraviolet Imager (SUVI) captured a moderate C2 class solar flare. 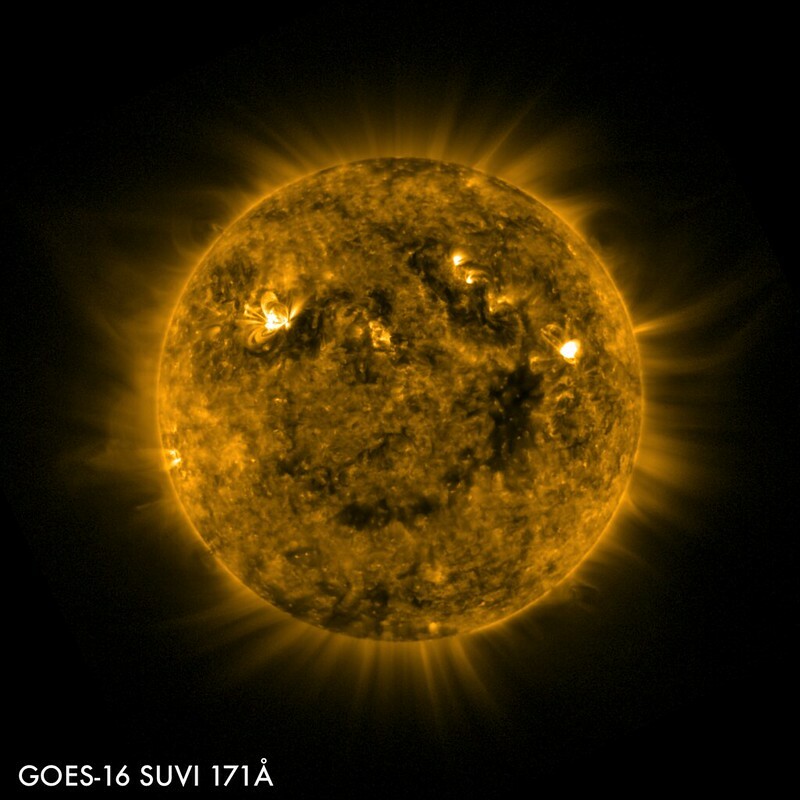 The flare is seen in the SUVI images as the bright active region in the top left quadrant of the sun. SUVI observes the sun’s atmosphere using six extreme ultraviolet (EUV) channels to gain a complete picture of the temperature structure of the corona. Depending on the size and the trajectory of solar eruptions, the possible effects to near-Earth space and Earth’s magnetosphere can cause geomagnetic storms which disrupt power utilities, communication and navigation systems, and may cause radiation damage to orbiting satellites and the International Space Station. Learn more about SUVI in this feature story. GOES-16 imagery of tropical storm Harvey on August 24, 2017, as it began to organize in the Gulf of Mexico. NOAA Scientist Kossin has released a paper on global slowdown of tropical cyclones. According to the study, tropical cyclones have slowed in both hemispheres and in every ocean basin except the Northern Indian Ocean. But, tropical cyclones have generally slowed more in the Northern Hemisphere, where more of these storms typically occur each year. Was Hurricane Harvey in 2017 just the beginning? Learn more about what is causing tropical cyclones to in this NOAA Satellites Story Map. The first imagery from NOAA’s GOES-17 Advanced Baseline Imager (ABI) made its public debut today. While experts continue to address an issue with the cooling system of the satellite’s imager, new views from GOES-17 show that its ABI is providing beautiful – and useful – imagery of the Western Hemisphere. This imagery was created using two visible bands (blue and red) and one near-infrared “vegetation” band that are functional with the current cooling system performance. Get additional information and see more GOES-17 ABI imagery in this feature story. NOAA’s GOES-17 satellite has transmitted its first data from the Extreme ultraviolet and X-ray Irradiance Sensors (EXIS) space weather monitoring instrument. This plot above shows the first 10 days of the Magnesium Index from GOES-17 EXIS measurements. It shows that solar activity is slightly decreasing during this time period, with no major solar flares. EXIS is able to measure changes in the Magnesium Index with better precision and much higher frequency than for any previous satellite, producing unprecedented information about space weather. Learn more about EXIS and this data in this feature story. GOES-16 SUVI image of large coronal hole. NOAA’s National Centers for Environmental Information (NCEI) Solar Terrestrial Physics (STP) scientists go far beyond data archiving and stewardship when it comes to GOES-R series space weather instruments and products. STP scientists participated in post-launch calibration of GOES-16’s space weather instruments. They also create space weather products which are used to study and forecast space weather. Learn more in this article from our partners at NCEI. NOAA’s Tim Schmit has been nominated for the Samuel J. Heyman Service to America Medals, or “Sammies.” The Sammies highlight excellence in the federal workforce. Tim Schmit has played a big role in the satellite technology that assists regions before, during and even after major weather events. As a NOAA meteorologist, Schmit has spent his 22-year career developing faster and better satellite technology for detecting and monitoring severe weather, including a number of major improvements in the past few years. Schmit’s work has focused on advancing the imaging technology of the satellites, primarily through the development of the Advanced Baseline Imager aboard NOAA’s GOES-R series of satellites. This technology provides higher-resolution images significantly faster than previous instruments. The Sammies, known as the “Oscars” of government service, are a highly respected honor with a vigorous selection process. Named for the Partnership for Public Service’s late founder who was inspired by President Kennedy’s call to serve in 1963, these awards align with his vision of a dynamic and innovative federal workforce that meets the needs of the American people. Check out our world through the eyes of NOAA's satellites in space. NOAA Satellite Maps is a suite of interactive Earth-viewing tools that offer real-time, high-resolution satellite imagery from NOAA’s most advanced geostationary and polar-orbiting satellites. NOAA’s Climate Prediction Center is forecasting a 75-percent chance that the 2018 Atlantic hurricane season will be near- or above-normal. There's a 70% likelihood of 10-16 named storms of which 5-9 could become hurricanes, including 1-4 major hurricanes. GOES-16, now operating as NOAA’s GOES East, will play a critical role in forecasting and warning during the upcoming hurricane season. Learn more in the 2018 Atlantic Hurricane Season Outlook, released May 24, 2018. 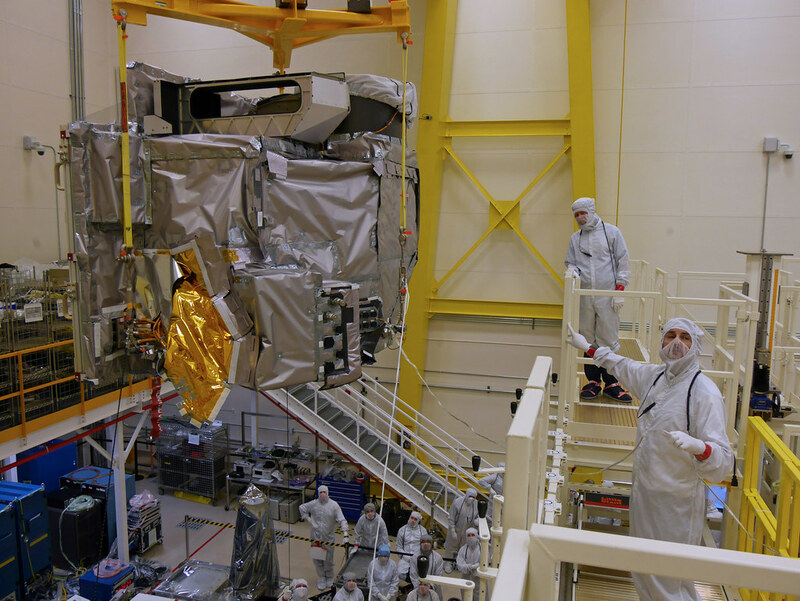 The GOES-R Program is currently addressing a performance issue with the cooling system encountered during commissioning of the GOES-17 Advanced Baseline Imager (ABI) instrument. The cooling system is an integral part of the ABI and did not start up properly during the on-orbit checkout. 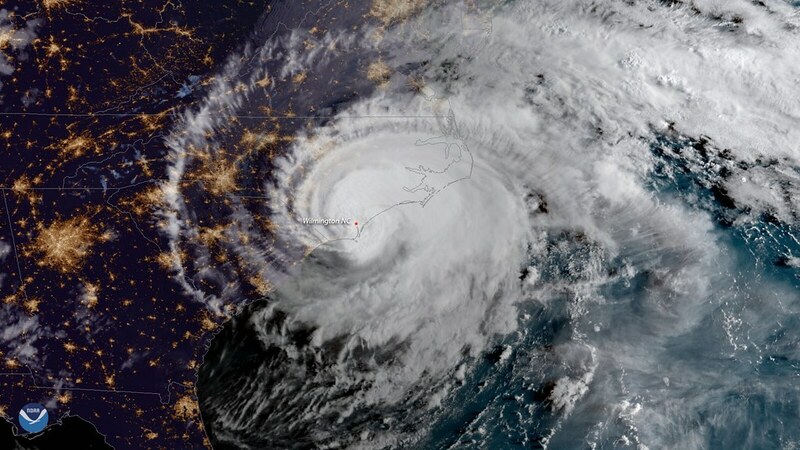 A team of experts from NOAA, NASA, the ABI contractor team and industry are investigating the issue and pursuing multiple courses of possible corrective actions. The issue affects 13 of the infrared and near-infrared channels on the instrument. At this time, we do not believe that the three channels with the shortest wavelengths, which includes the visible channels, are significantly affected. NOAA’s operational geostationary constellation -- GOES-16, operating as GOES-East, GOES-15, operating as GOES-West and GOES-14, operating as the on-orbit spare -- is healthy and monitoring weather across the nation each day, so there is no immediate impact from this performance issue. If efforts to restore the cooling system are unsuccessful, alternative concepts and modes will be considered to maximize the operational utility of the ABI for NOAA's National Weather Service and other customers. An update will be provided as new information becomes available. The second Geostationary Lightning Mapper (GLM) to ever reach orbit has shared its first images. This initial imagery from NOAA’s recently launched GOES-17 satellite captured a line of severe storms forming over the Plains on May 9, 2018. Experience from the initial GOES East GLM is helping scientists and engineers tune this new instrument, which eventually will extend GLM coverage over most of the Pacific Ocean. Data from GLM helps inform forecasters when a storm is forming, intensifying and becoming more dangerous. Learn more about the first GLM imagery and the instrument in this feature story. The Space Environment In-Situ Suite (SEISS) instrument on board NOAA's GOES-17 satellite is successfully sending data back to Earth. This plot shows four days of SEISS data from May 4 through May 7, 2018, when the instrument observed electrons and protons associated with a geomagnetic storm. The source of this storm was first detected by NOAA’s DSCOVR (Deep Space Climate Observatory) satellite on May 5. Orbiting a million miles from Earth, DSCOVR observed a high-speed stream of solar wind plasma that had escaped from a coronal hole, a cooler and less dense area of the sun. The high-speed plasma plowed through the slow solar wind ahead of it and 'kicked' the Earth’s magnetosphere, a “bubble” that protects us from the solar wind. This 'kick' started a global disturbance in the magnetic field known as a geomagnetic storm. In response, NOAA’s Space Weather Prediction Center (SWPC) issued a G2 (moderate) geomagnetic storm warning on May 6. Geomagnetic storms can disrupt power utilities and communications and navigation systems and may lead to increased levels of radiation in the radiation belts that can damage orbiting satellites and the International Space Station. Radiation belts are regions of enhanced populations of energetic electrons and protons surrounding the Earth. The GOES-17 SEISS observed the complex response of radiation belt electrons and protons to this geomagnetic storm starting on May 5. The large increase in the levels of electrons triggered a radiation belt alert by SWPC midday on May 6, half a day after the geomagnetic storm alert. Radiation belts are regions of enhanced populations of energetic electrons and protons surrounding the Earth. The five sensors that make up the GOES-17 SEISS instrument have been collecting data continuously since April 24, 2018. SEISS is better able to detect energy fluxes in the magnetosphere than the previous generation of NOAA geostationary satellites. After GOES-17 is commissioned, SEISS will be used by SWPC to issue the radiation belt alerts. 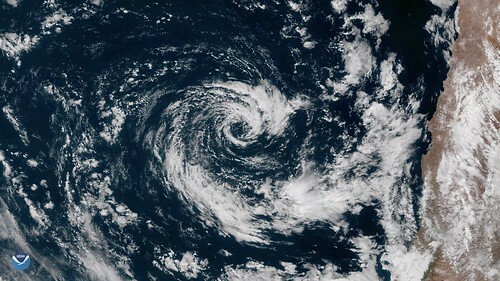 GOES East GeoColor imagery of subtropical cyclone off the coast of Chile on May 9, 2018. The GOES-R Series Program quarterly newsletter for the time period January – March 2018 is now available. GOES-S lifted off on a picture perfect day right at the opening of the launch window on March 1. The satellite reached geostationary orbit on March 12 and was renamed GOES-17. GOES-17 is now undergoing post-launch testing in preparation for taking over as NOAA’s GOES West operational satellite late this year. View the 1Q 2018 newsletter. 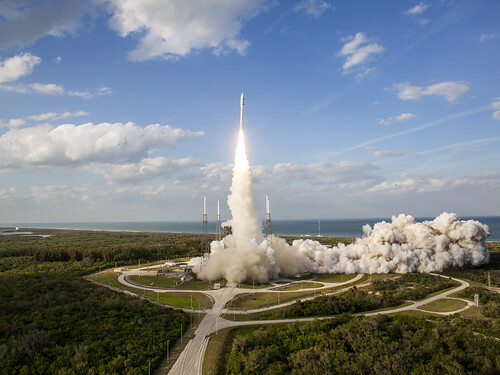 On March 1, 2018, at 5:02 PM ET, NOAA’s GOES-S satellite blasted off into space and soon took its place as GOES-17, the nation’s newest satellite in NOAA’s most advanced geostationary series. The Atlas V rocket that launched the satellite propelled it into orbit 22,000 miles above Earth. Although the young satellite has already traveled far from home, its journey to become a vital component of the United States’ weather forecasting operations is only just beginning. Find out what's next for our newest member of the team in this feature. On March 22, 2018, the GOES-17 Magnetometer (MAG) became the first instrument on the satellite to begin transmitting data! This figure shows data from the outboard Magnetometer instrument on board the GOES-17 satellite. The data has been filtered to highlight a space weather phenomenon known as plasma waves. These waves play a significant role in controlling the levels of dangerous energetic particles that can cause damage to satellites and harm astronauts. An important characteristic of these waves is how fast they oscillate up and down or their frequency (shown in the bottom panel of the figure). The Magnetometers on the GOES-R Series of satellites, with five times higher resolution, can observe more wave frequencies allowing us to undertake research into new space weather products that help forecasters better determine the likelihood that elevated levels of dangerous energetic particles will occur during space weather events. On March 12, GOES-S executed its final liquid apogee engine burn, placing the satellite in geostationary orbit 22,236 miles away. GOES-S is now GOES-17! Tomorrow, GOES-17 will perform its second stage solar array deployment, releasing the solar array yoke and solar pointing platform. In the days that follow, several maneuvers will be conducted to put GOES-17 in its 89.5 degrees west longitude checkout position. Learn what’s next for GOES-17 in this feature story. GOES-16 SUVI image of solar flare. When the sun flared dramatically last September, causing geomagnetic storms and radio blackouts on Earth, a new NOAA solar telescope captured the drama from a different perspective. Now, NOAA has released these new images to the scientific community. The primary mission for the GOES-R Series Solar Ultraviolet Imager, or SUVI, is to support space weather forecasting operations at NOAA’s Space Weather Prediction Center, but its unique properties offer several opportunities for new research. Learn more in this feature from NOAA’s National Centers for Environmental Information. GOES-S launched at 5:02 p.m. EST on March 1, 2018. After a successful separation from the Centaur upper stage, GOES-S began flying freely. Shortly after, the satellite completed deployment of the Stage 1 solar array that will generate electricity for the spacecraft during its mission. GOES-S is orbiting above the Earth, its systems are in good health and it is operating on its own. Learn more in the NOAA press release. Booster ignition and liftoff of the United Launch Alliance Atlas V rocket at 5:02 p.m. EST, from Space Launch Complex 41 at Cape Canaveral Air Force Station in Florida, carrying NOAA’s GOES-S satellite. The rocket is on its way, carrying NOAA’s second in a series of four next-generation weather satellites. About four minutes into flight, a series of key events occurs in rapid succession: Atlas booster engine cutoff, separation of the booster from the Centaur upper stage, ignition of the Centaur main engine for its first of two burns, then jettison of the payload fairing. Follow the GOES-S Blog for updates. Atlas V carrying GOES-S rolls to the launch pad. The United Launch Alliance Atlas V rocket and its GOES-S payload were moved to the launch pad today as preparations continue for Thursday’s launch from Space Launch Complex 41. The Atlas V is in its 541 configuration, which means it has the 5-meter-diameter payload fairing, four solid-fueled boosters and the Centaur upper stage is equipped with a single engine. Liftoff remains on schedule for 5:02 p.m. EST tomorrow. Meteorologists with the U.S. Air Force 45th Space Wing are predicting an 80 percent chance of favorable weather for liftoff of the Atlas V rocket. On launch day, the primary weather concern is cumulus clouds and strengthening ground winds. 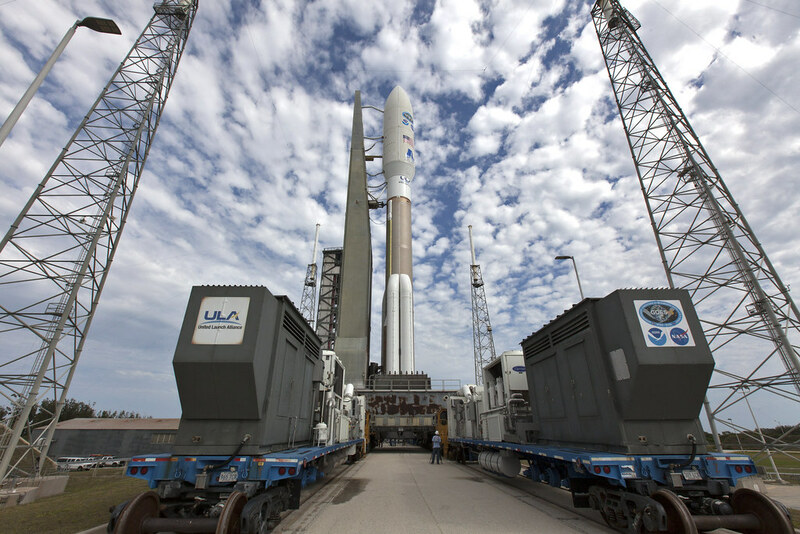 NOAA GOES-S will travel to space aboard a ULA Atlas V 541 expendable launch vehicle, or rocket. The “541” refers to the configuration of the rocket: payload fairing, or nose cone, that covers the satellite is approximately 5 meters in diameter; the four solid rocket boosters that generate extra thrust off the launch pad; and a single engine on the Centaur upper stage. Fully fueled, GOES-S’s Atlas V 541 rocket weighs more than 1 million pounds and is approximately 197 feet tall. GOES-S and its Atlas V rocket will begin its journey to space when the booster engine and solid rocket boosters ignite and the rocket blasts off. Just under 2 minutes after leaving the launch pad, the rocket’s four solid rocket boosters will complete their burns and be jettisoned while the Atlas booster continues to burn. Approximately 90 seconds later, the payload fairing halves separate and fall back, no longer needed after leaving Earth’s atmosphere. About a minute later, the booster engine will shut down, known as booster engine cutoff (BECO), and the booster and Centaur upper stage separate. With the upper stage now flying free, the main engine will start its first burn. This burn will last for nearly eight minutes before the first main engine cutoff (MECO-1). After a total of three burns of the Centaur upper stage engine, GOES-S will separate from the upper stage and fly alone in space for the first time! This will occur roughly three and a half hours after liftoff. In the days that follow, GOES-S will perform several instrument deployments and a series of maneuvers to bring the satellite into geostationary orbit. This is scheduled to occur 17 days after launch. Once NOAA GOES-S, now GOES-17, is placed in geostationary orbit, it will undergo a period of checkout and validation, moving to the GOES West operational position in late 2018. February 27, 2018: NOAA GOES-S (GOES-17): High Definition GOES West! In 2018, NOAA launches the GOES-S satellite, which takes its place in orbit as GOES-17. Working together with GOES-16, the two new geostationary weather satellites will provide constant watch over the United States and the Western Hemisphere from the west coast of Africa all the way to New Zealand, helping monitor severe storms, wildfires, and daily weather patterns. 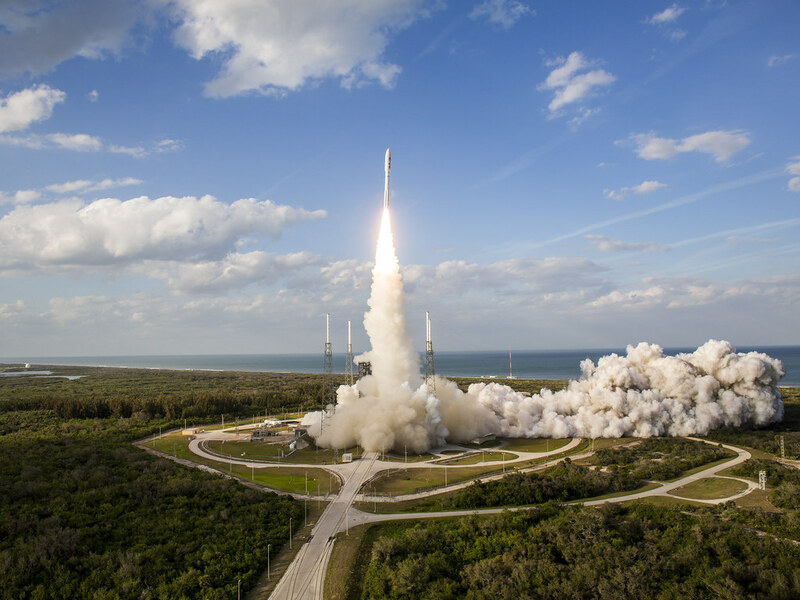 Managers from NASA, NOAA, U.S. Air Force 45th Space Wing and United Launch Alliance gave a unanimous “go” for launch of the GOES-S spacecraft on March 1 at 5:02 p.m. EST on a United Launch Alliance Atlas V rocket. The decision followed the Launch Readiness Review on February 27 at Kennedy Space Center in Florida. NASA, NOAA and United Launch Alliance controllers and engineers conducted a full Mission Dress Rehearsal on February 23 for the launch of the GOES-S spacecraft. The practice is standard for the launch team as it prepares for a mission. Working from consoles in facilities at Cape Canaveral Air Force Station, the teams ran through the same systems and processes they will use for the actual launch, which is set for March 1 at 5:02 p.m. EST. At the conclusion of the Flight Readiness Review at Kennedy Space Center in Florida on February 23, senior NASA and contractor managers voted to proceed with processing toward the targeted launch of GOES-S on a United Launch Alliance Atlas V rocket at 5:02 p.m. EST on Thursday, March 1. 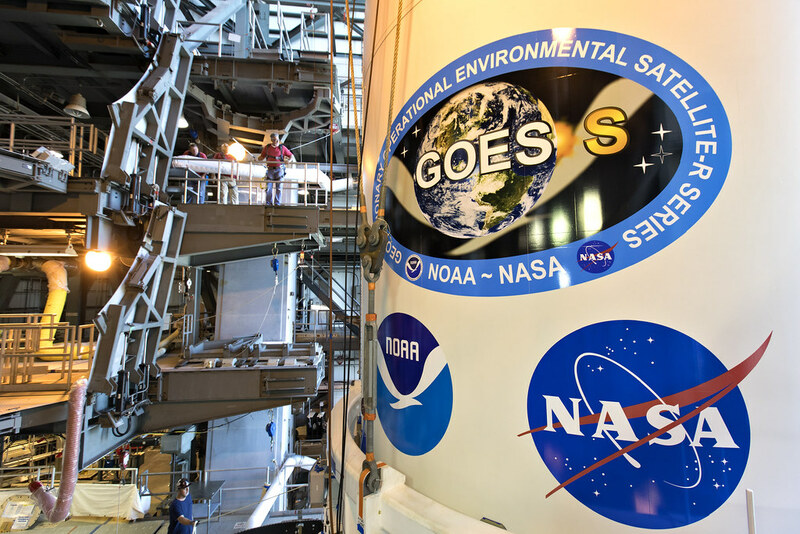 A final “go” decision will be made at the GOES-S Launch Readiness Review on February 27. Working in concert with the recently launched GOES-16, the two new geostationary weather satellites will provide constant watch over the United States and the Western Hemisphere, helping monitor severe storms, wildfires, and daily weather patterns. GOES-S will provide better data coverage over the northeastern Pacific, where many weather systems that affect the western U.S. originate. Greater coverage means that GOES-S will be in an ideal location to monitor weather hazards unique to the western U.S. These include wildfires, coastal fog, and atmospheric river events, when storms from the Pacific dump heavy rain and snow over the western U.S. Better monitoring of these heavy precipitation events will lead to timelier warnings to the public about hazards such as flooding and mudslides. February 20, 2018: Five Reasons GOES-S will be a Game-Changer for Weather Forecasts in the Western U.S.
On March 1, 2018, NOAA’s newest geostationary satellite will launch into space from Cape Canaveral, Florida. GOES-S (which will become GOES-17 once it reaches its final orbit) will significantly enhance weather forecasting capabilities across the western United States, Alaska, and Hawaii and provide critical data and imagery of the eastern and central Pacific Ocean extending all the way to New Zealand. Here are five reasons why GOES-S will be such a game-changer for weather forecasts from California to Alaska and beyond. NOAA’s GOES-S is scheduled to launch Thursday, March 1, 2018. The launch, as well as the pre-launch mission and science briefings on February 27, will air live on NASA Television and the agency’s website. 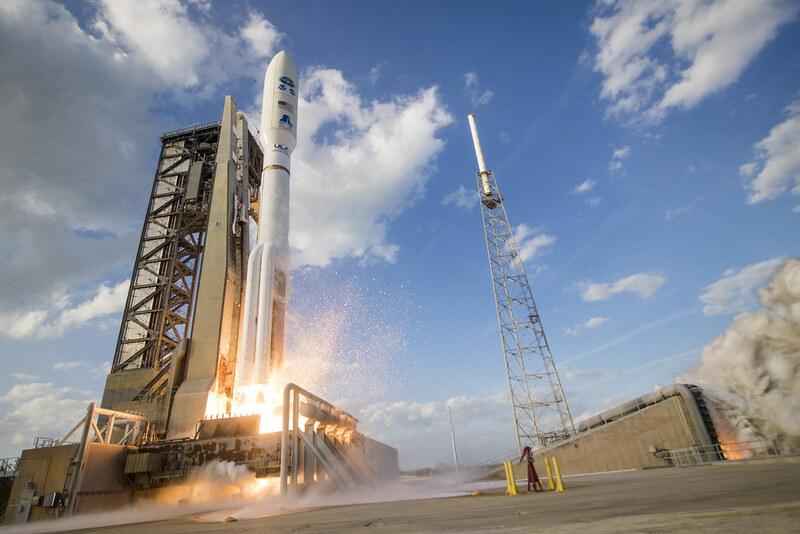 At 5:02 p.m. March 1, a two-hour launch window will open, during which GOES-S will launch on a United Launch Alliance Atlas V rocket from Space Launch Complex 41 at Cape Canaveral Air Force Station (CCAFS) in Florida. Launch coverage will begin at 4:30 p.m. Learn more about NASA Television’s coverage of GOES-S launch events. The payload fairing containing GOES-S is lifted by crane for mating to the Atlas V rocket. On February 16, 2018, GOES-S, secured inside its payload fairing, was transported from its processing location at Astrotech Space Operations in Titusville, Florida, to the United Launch Alliance Vertical Integration Facility at Cape Canaveral Air Force Station’s Space Launch Complex 41. There, the satellite was raised into position atop the Atlas V rocket that will send it into orbit on March 1. View more photos of the lift and mate operation. Technicians and engineers monitor progress as GOES-S is encapsulated in its payload fairing. 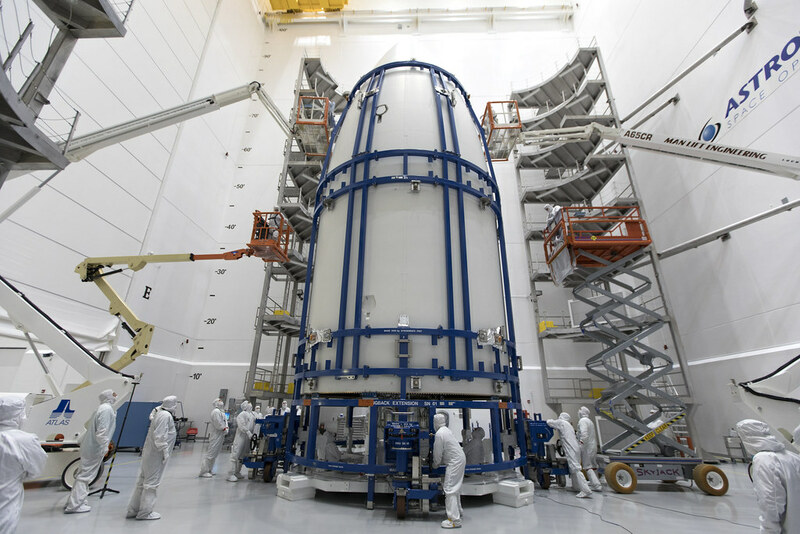 GOES-S is now encapsulated inside its payload fairing at the Astrotech payload processing facility in Titusville, Florida, near NASA's Kennedy Space Center. The payload fairing protects the spacecraft during the ascent through Earth's atmosphere on its way to orbit. 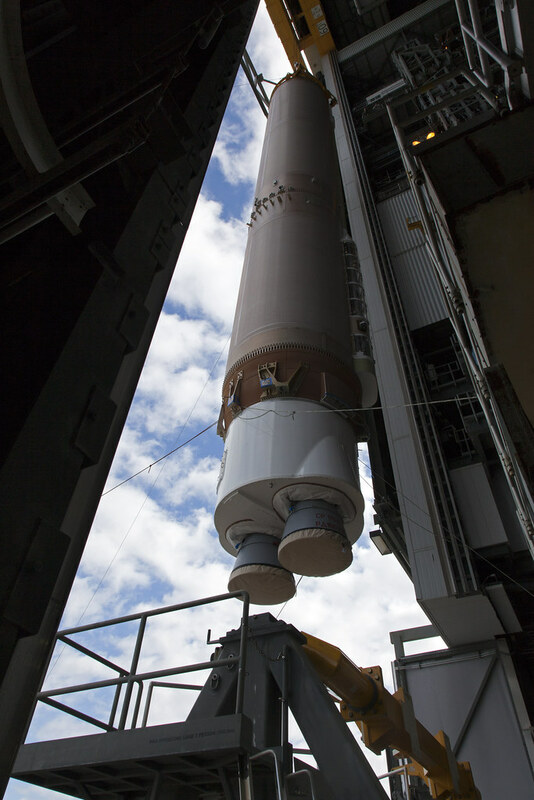 GOES-S will soon be moved to Space Launch Complex 41 at Cape Canaveral Air Force Station for mounting atop the Atlas V rocket that will boost the satellite to orbit. NOAA satellites are equipped to detect distress signals. NOAA satellites helped save the lives of 275 people last year! Although NOAA satellites, like GOES-16, are known for weather forecasting, they also play a vital role in assisting in the rescue of those in distress at sea or on land. NOAA satellites are part of the international Search and Rescue Satellite Aided Tracking System, or COSPAS-SARSAT, which uses a network of U.S. and international spacecraft to detect and locate distress signals quickly from emergency beacons aboard aircraft, boats and from handheld PLBs. Learn more about how NOAA satellites help rescue people in distress. 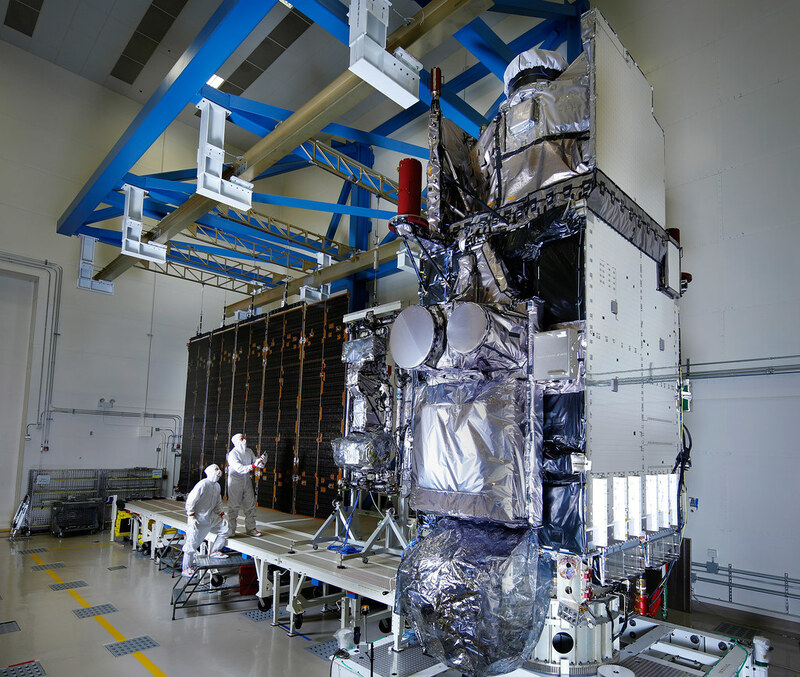 Integrated GOES-S satellite in a clean room, with solar array deployed. NOAA is one month from launching GOES-S, its newest geostationary weather satellite that will begin providing faster, more accurate data to track storm systems, lightning, wildfires, dense fog, and other hazards that threaten the western U.S., Hawaii, and Alaska. More detailed observations will improve marine, aviation forecasts, wildfire detection and more. Read the announcement. A crane lifts the GOES-S United Launch Alliance Atlas V first stage at the Vertical Integration Facility at Space Launch Complex 41 at Cape Canaveral Air Force Station in Florida. The United Launch Alliance Atlas V first stage for GOES-S has been lifted to the vertical position inside the Vertical Integration Facility at Space Launch Complex 41 at Cape Canaveral Air Force Station in Florida. The first stage of the rocket holds the fuel and oxygen tanks that feed the engine for ascent and powers the spacecraft into geostationary orbit. The rocket is being prepared to launch the satellite on March 1, 2018. Additional photos of the Atlas V first stage booster lift to vertical on stand. The three men behind the successful launch of Explorer 1 on January 31, 1958: Dr. William H. Pickering (left), Dr. James A. van Allen (center) and Dr. Wernher von Braun (right). As NOAA’s next-generation weather satellites continually improve weather forecasts in the United States and beyond, it’s worth remembering how we got to where we are today. Today marks the 60th anniversary of America’s first successful satellite launch, ushering in a new era of space exploration and scientific discovery. Learn more in this feature story. Under the watchful eyes of technicians and engineers, the Centaur upper stage that will help launch NOAA’s GOES-S spacecraft is lifted from its transporter inside the Delta Operations Center at Cape Canaveral Air Force Station. The Centaur upper stage, part of the United Launch Alliance Atlas V rocket that will help launch GOES-S, is in place for prelaunch processing. The Centaur holds theThe Centaur arrived at the Delta Operations Center at Cape Canaveral Air Force Station on January 24, two days after its delivery by ship to nearby Port Canaveral. Media accreditation is open for the launch of NOAA’s GOES-S satellite on Thursday, March 1, 2018. GOES-S is scheduled to launch at 5:02 p.m. EST from Cape Canaveral Air Force Station (CCAFS) in Florida. Media prelaunch and launch activities will take place at CCAFS and NASA’s neighboring Kennedy Space Center. International media without U.S. citizenship must apply by 4:30 p.m. Tuesday, Feb. 13, for access to Kennedy media activities only. U.S. media must apply by 4:30 p.m. Monday, Feb. 19. Learn more and apply for GOES-S launch media accreditation. The fueled GOES-S spacecraft in a clean room at Astrotech Space Operations. The propellant, including fuel and oxidizer, that will take GOES-S to orbit is now loaded in the spacecraft. The fuel loading process began on January 24 with a checkout of all the equipment, ensuring no leaks and correct flow rates. The team prepared for the hazardous operations by donning SCAPE suits (Self-Contained Atmospheric Protective Ensemble) that cover their bodies and provide a clean air source, as the fuel and its vapors are toxic. The chemical purity of the hydrazine was first tested for purity then pumped from the storage tank into the spacecraft fuel tank. On January 27, the oxidizer was loaded, following the same process, except that two spacecraft oxidizer tanks were filled. At the end, the spacecraft was weighed and its center of gravity measured. The United Launch Alliance Atlas V booster and Centaur stage for NOAA’s GOES-S arrived this week at Cape Canaveral Air Force Station in Florida. A Mariner transport ship delivered the components to the Army Wharf at Cape Canaveral Air Force Station.The Atlas V booster was moved to the Atlas Spaceflight Operations Center near Space Launch Complex 41; the Centaur was taken to the Delta Operations Center. GOES-S is preparing for a March 1, 2018 launch. Top officials from NOAA, NASA and the California Department of Forestry and Fire Protection will hold a media teleconference on February 1, 2018, to discuss how NOAA’s GOES-S, the second in a series of next-generation geostationary weather satellites, will help provide faster, more accurate data for tracking lightning, storm systems, wildfires, dense fog and other hazards that threaten the western U.S., Hawaii and Alaska. Learn more in this NOAA media advisory. Are you passionate about all things space, satellites and social media? Then this is the event for you. Don’t miss this behind the scenes opportunity to snap, post, tweet, and share everything about the launch of NOAA’s GOES-S satellite. Social media users are invited to register to attend the NOAA GOES-S Launch Social on February 28 – March 1, 2018, at Kennedy Space Center in Florida. The deadline to apply is 11:59 p.m. EST on January 29, 2018. Learn more about the GOES-S social and apply for accreditation. On January 16, 2017, media outlets got an up-close look at NOAA's GOES-S, the second in a series of highly advanced geostationary weather satellites. 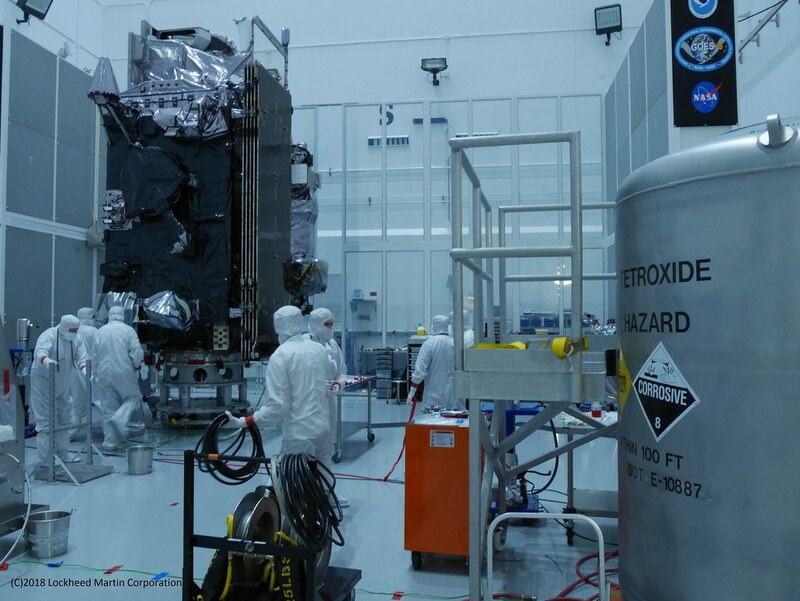 Currently, the satellite is inside a secured clean room at Astrotech Space Operations in Titusville, Florida. Media had the opportunity to photograph GOES-S and conduct interviews with National Weather Service, GOES-R Series Program, Lockheed Martin and Harris personnel. GOES-S is scheduled to launch March 1, 2018, from Cape Canaveral, Florida,, and will be known as GOES-17 when it reaches final orbit. After an orbital test phase of its six instruments and their data, GOES-17 will be declared operational as the new GOES-West satellite. 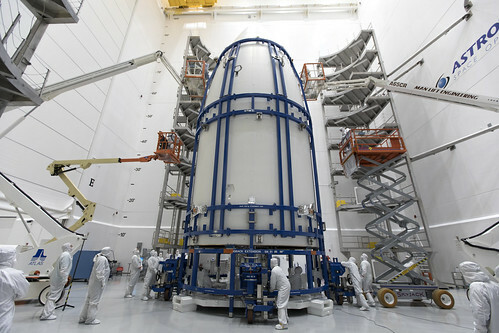 Technicians and engineers are preparing NOAA’s GOES-S satellite for encapsulation in its payload fairing inside a clean room at Astrotech Space Operations in Titusville, Florida. After encapsulation, the satellite will be moved to Space Launch Complex-41 at Cape Canaveral Air Force Station. GOES-S is slated for launch on March 1, 2018, aboard a United Launch Alliance Atlas V rocket. The GOES-R Series Quarterly Newsletter for the time period October – December 2017 is now available. GOES-16 is now fully operational as NOAA’s GOES-East satellite and forecasters are thrilled. GOES-S was delivered to Kennedy Space Center and is undergoing final preparations for launch on March 1, 2018. We will soon have two game-changing geostationary satellites watching over the Western Hemisphere! View the 4Q 2017 newsletter. GOES-13 view of Hurricane Sandy intensifying the Caribbean Sea before the storm tracked up the U.S. East Coast in October 2012. For more than seven years, NOAA’s GOES-13 satellite actively monitored the skies as NOAA’s operational GOES-East satellite, serving as a critical source of information during major weather events, from crippling snowstorms to powerful hurricanes. On January 8, 2018, GOES-13 was turned off, ceding GOES-East observational duties to GOES-16. The satellite will now drift into storage at 60 degrees west longitude, and be available as a backup if needed. As GOES-13 reaches the end of its operational service life, here’s a look back at the satellite’s unique history and its most memorable imagery. NOAA's GOES-16 (GOES-East) satellite caught a dramatic view of the bomb cylcone moving up the East Coast on January 4, 2017. On January 4, 2018, a powerful nor’easter battered coastal areas from Florida to Maine with heavy snow and strong winds. The storm has also been called a ‘bomb cyclone’ because it underwent “bombogenesis” which occurs when a mid-latitude cyclone rapidly intensifies over a short period and see its central pressure drop 24 millibars or more within 24 hours. Storms like this typically bring heavy precipitation, strong winds, and coastal storm surge and are common along the East Coast during the winter months. Learn more about bombogenesis in this NOAA feature and a read a summary of the event including breathtaking GOES-16 imagery in this story from the National Weather Service.